The most Forex technical indicators programmed for the price analysis not the time. Here I want show you how to use Forex Time Cycle strategy to analyse the market better than before without any Forex indicators. When the market start a trend you can see that we have start time and the end time for the trend well what does it mean? It means that after specify time the trend stopped and now you don’t know the trend will continue or not! To understand it there is a simple method you can wait until time cycle completed. It means that the bearish trend on EURUSD was strong enough and the buyer was not success full to change the trend after with the same period of times. Well when you know this you can predict that the market will go down again ! As you can see the market go down after the time cycle this is a good method and simple method to understand the Forex market trend power. Do we have real trend or this is just market cheat movement?! For example EURUSD behavior is different from GBPUSD or GBPJPY or USDJPY and etc. Because EUR market is different than US market and etc. 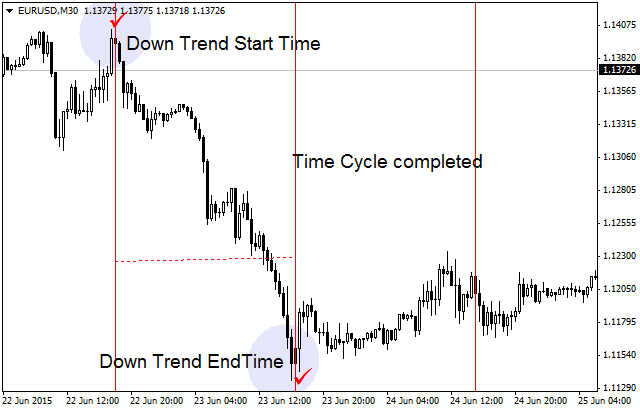 Time cycle analysis can help you to improve your idea about the correct market trend you can understand when it’s probable that the market trend change. 1- It was real movement or cheat? Cheat movement means short time movement in other hand some time market go back to start again and we think that the market want come back and the trend changed. 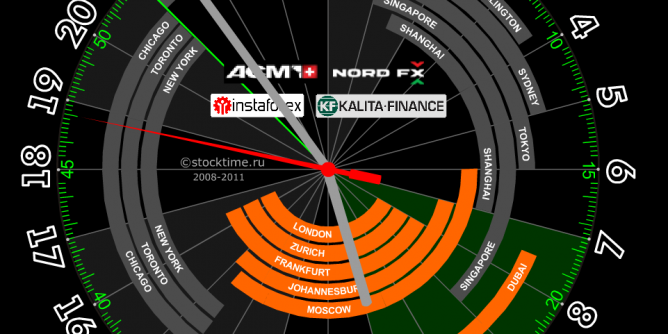 A Fibonacci time zone line is good tool to analyse the Forex Cycles. As you can see we had bearish trend on EURUSD when the trend finished market did not come backed so the next cycle market will give you sell signal but the market stopped ! I draw the Fibonacci time line from the start trend time to the end trend time and the other lines drawn automatically. When the second time cycle passed we should think about the new market trend with the Fibonacci time zone we can wait till the third and fourth time cycle. The best strategy in this area is look at reversal movement to enter a buy positions.